The Bike Walk CT Annual Dinner & Silent Auction sold out again this year--we're grateful so many of our bike ped friends from across the state could join us to support the organization at last week's benefit event. Click below for photos. 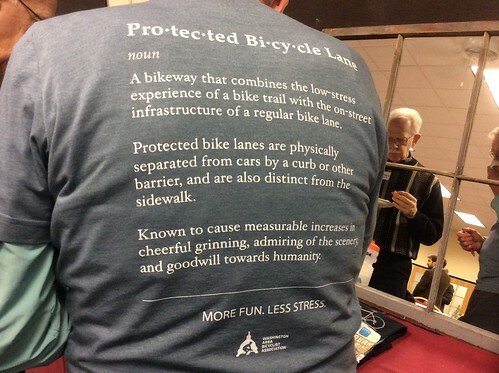 New this year were our People's Choice Awards--recognition of Connecticut's bike ped champions as seen by their peers. Winners of this year's People's Choice Awards included: Debbie Thibodeau and Ken Messier, both of Simsbury; Senator Beth Bye, Clare Kindall, Lene Bruun, Scott Franklin, Robert Dexter, all of West Hartford; Mayor Erin Stewart, New Britain; Anthony Cherolis and Yanil Teron, both of Hartford; and Dave Hildebrand, Ellington. Featured speaker Colleen Kelly Alexander inspired us all with the story of her tragic accident, remarkable recovery, and determination to make Connecticut a better place to bike and walk. Earlier this week the U.S. House of Representatives passed a long-awaited transportation bill. Sometimes the hardest work results in nothing happening, and that can be the biggest victory of all. Through the advocacy efforts of groups like the League of American Bicyclists, Rails to Trails, the Alliance for Biking and Walking, Transportation for America, and grassroots advocates like us, we fended off attacks on core trails and active-transportation programs. Bad proposals known as the Carter and Yoho amendments did not even make it to the floor for a vote. The Carter and Yoho amendments would have made biking and walking projects ineligible for certain types of transportation funding, compromised local small project funding often used for bicycling and walking projects, and made the Recreational Trails Program ineligible for any transportation funding. Bad ideas, all of them! The underlying Surface Transportation Reauthorization and Reform Act rolls transportation alternatives into the surface transportation block grant while maintaining the local control aspects and competitive process that made transportation alternatives program effective at helping Mayors and communities fund their transportation priorities important to their communities. Next up is a conference committee, where the Senate and House will negotiate a final bill. To learn more about what is in the bill, and how it compares to the Senate bill, sign up for the LAB webinar on Tuesday November 10, here. How do I get from home to the trail without using a car? That's the theme of the Farmington Valley Trails Council Annual Meeting on Nov. 5--and we're pretty sure the answer will include "complete streets" and tips from our NACTO Bikeway Design Workshop! Dave shares the stage with noted international consultant Mary Embry Mobycon. Details below and at www.fvgreenway.org.